Remind that Jardines del Rey, part of the province of Ciego de Avila, is a very touristical area, these islands are only visited by foreigners and some Cubans who work in tourism. Cuba-Junky visited these islands and has come to the conclusion that this part of Cuba is very beautiful and a must visit when you want to relax in beautiful resorts located at virgin white beaches and the warm azul sea ... the pictures don't lie ... this is Jardines del Rey! Las Coloradas, Playa Larga and El Paso are outstanding beaches. In Flamencos Beach (Flamingo beach) they also offer horse rides. Pilar beach, located in the most privileged sector of Key Guillermo, is an example of the supreme of the tropic. It is at the foot of one of the highest sand dunes in the insular Caribbean (15 meters above the sea level). Very special to see is the largest lake of Cuba "Laguna de la Leche" (the lake of milk) the name is because of the clay bottom creates the color of the water, it is a favorite spotfor water sports. The cayos (see below) have scenery of amazing tropical beauty, where the lush natural vegetation and man-made comforts combine to create a unique setting that is perfect both for those who love adventure and for those who seak peace and quiet. (143 square miles, 370 km in size) has over 13 and a half miles (22 km) of fine white sandy beaches bathed by turquoise water protected by coral reefs. Ninety percent of its territory is covered with vegetation (mainly forest), and over 200 of spcies of birds-including a colony of more than 30.000 Roseate Flamingos (Phoenicopterus ruber ruber)- live here. Few other places in the Caribbean can compete with the beauty of the seabed and number of fish in this area. There are four scuba diving centers and 20 diving sites along 20 miles (32 km) of coastline. In its warm, clear water, that is between 16.5 and 131 feet (between 5 and 40 m) deep, you can see Parrotfish (Sparisoma spp. ), Grunts (Haemulon spp. ), Yellowtail Snappers (Ocyurus chrysurus), Queen Angelfish (Holacanthus ciliaris). other Angelfish (Pomacanthu spp. ), Anemones (Lebrunia danae), Spiny Lobster (Panulirus argus) and a great variety of underwater plants. Is located in the center of the key. It creates a small village built in style of the ancient charcoal maker that existed here in the first half of the 20th century. The name La Guira comes from the many calabashes (Guira is Spanish for Calabash) trees that grow here, which in the past were very useful to local residents, who used the round calabash shells as mugs and containers. Today they are used in the making of maracas, those popular musical instruments. Cuban cuisine and cocktails, rides on horseback, campesino fiestas, trained animals shows and small cabins where visitors can stay are available at Sitio La Guira. Located at the end of the key and west of Punta del Cuerno is very near the Cueva del Jabali recreation center, on the coastal strech between Punta del Puerto and Playa Dorada. A road leads from here to the sand dune of Loma del Puerto. The trail of Loma del Puerto is a tiny walkwalkway that allows for the observation of the coastal flora. One can follow it from Playa Prohibida until the very middle of the key, where it seems to stop only to go on along the northern coast all the way to the dune of Loma del Puerto, a peculiar geo-morphological formation resulting from the continued accumulation of sand transported during hundreds of years by the waves and the wind. This is how beautiful, natural, 13-meter high lookout was formed. We went there in Dec. 2010, unfortunately we did not have the time for a lunch. Friendly place! This little private bar & it's staff is a must to see For a small price you can enjoy a refreshment & some real Cuban dish of fresh fish usually caught that day. Listen to a bit of Cuban music. Bring a fishing rod You may get to eat your own catch.If it's the Red Snapper OMG!!!! D.E.L.I.C.I.O.U.S. And if you think of it bring an old license plate from home. to hang up. If you go once, You'll return with a great memory. & say Greg Wilson said Halo! Located between Punta Caimanera and Punta Rasa is one of the smallest but coziest beaches on Cayo Coco. Near this beach is the Talasotherapy Center a facility that offers different services to improve quality of life. Streches from Punta Rasa to Penon de las Colorades where visitors will come across the Rocarena Retaurant. (5 square miles, or 13.2 square km, in size) is much smaller but just as fascinating. It has two miles (three and a half km) of beaches and the tallest sand dunes in the Caribbean Islands (they reach over 52.5 feet, or 16 m, above the sea level). (Just over 2 square miles, or six square km, in size) is another jewel in terms of beaches and natural invironment. It has a beautiful wrought iron lighthouse (built in 1857) that is over 157 feet (48 m) tall. Because of their rich biodiversity and beautiful scenery, Cayo Coco and the islets near it are part of the Buenavista preserve of the biosphere. 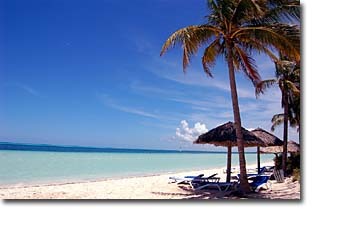 Cayo Romano-300 square miles, or 777square km, in size, making it almost an island-is very close by. These Cayos are in the Jardines del Rey Archipelago, off the Northern shore of Ciego de Avila Province, in east-central Cuba, 268 miles (432 km) from Havana. Direct flights from Europe and other parts of the Americas put in at Ciego de Avila's Maximo Gomez International Airport, which is linked to Cayo Coco by a highway 60 miles (97 km) long, the last ten and a half miles (17 km) of which are on a spectacular stone causeway bordered by the sea. 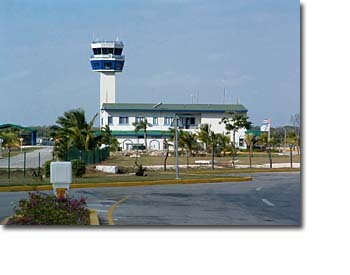 Cayo Coco also has a modern international airport with several flights each week. Moreover, a stone causeway links this island to Guillermo and Paredon Grande. 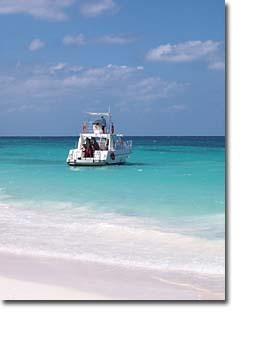 Or you can arrive by boat, putting in at the Puerto Cayo Guillermo Marina or at Casana Port. On July 26th, 1988 the causeway, linking to Cayo Coco with the mainland was completed, paving the way for the tourist development of Jardinez del Rey. 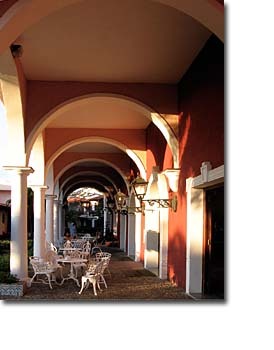 In 1993, tourist exploitation began, when President Fidel Castro inaugurated the area's first hotel, built in the style of the first, early 16th century Cuban Colonial villages. The construction of these roads over the sea has not stopped, in spite of the magnitude of the project for a small country like Cuba, besieged by scarcities and economically blockaded. Already connected with the mainland through Cayo Coco, are Cayo Guillermo, Cayo Romano, and Cayo Paredon Grande. 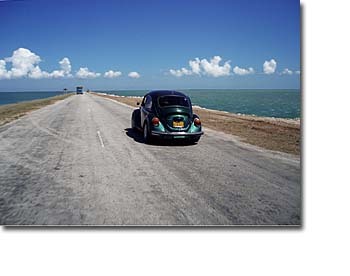 A causeway also connects Cayo Sabinal and Cayo Cruz from Northern Camaguey. More than 1000 visitors have arrived in this destination through the Jardines del Rey International Airport that opened on December 26th, 2002. This facility with a three thousand meter-long runway has helped to shorten the distances between Cayo Coco and Cayo Guillermo and the "Maximo Gomez International Airport" in more than 80 km. The terminal features all necessary facilities for its operation. The archipelago's main temperature is 26C for the high and 17C the low. June, July and August are the warmest months while December, January and February are the coolest with a main temperature of 20C. Influenced by the sea, temperatures at the keys are milder than in mainland. The seawater main temperature varies from 28 to 30C degrees. The keys have a 90-day rain season a year. The average rain accumulate is 40 inches a year. Two well-defined seasons from May to October and the dry season from November to April. Around 17 km/h winds blow predominantly from the northeast. Ocean waves are usually moderate. Activities include lazing in the sun; swimming; going for rides on Kayaks, pedal boats, pedal boats, yachts, catamarans, motorboats, sailboats and glass-bottomed boats; windsurfing, waterskiing and other water sports. There is a Gymnasium, tennis courts, a miniature golf course, volleyball courts, table games, horseback riding, rental cars and motor cycles, buses and horse drawn carriages. Go snorkeling, scuba-diving or sports fishing. Or go for an excursion (living on board). There are many places for hiking through evergreen forests and mangrove thickets to lakes for seeing colonies of Roseate Flamingos (Phoenicopterus ruber ruber), many other species of birds and land animals-for example, in the El Baga Natural Park. Go to a farm party or visit nearby Ciego de Avila Province and other tourist resorts in Cuba, it's all possible thanks to the many flights that connect almost everywhere in the Cuban archipelago. For evening entertainment, choose among several discotheques, shows, hotel entertainment and other options. The International Diving Center on Punta Rasa, along the north coast, offers marine excursions, sea-faris, diving lessons, snorkeling and other recreational water sports. The Aguas Tranquilas Marina is on the eastern end of Cayo Coco, at the soft Ensenada de Bautista, just across from the coral reef. 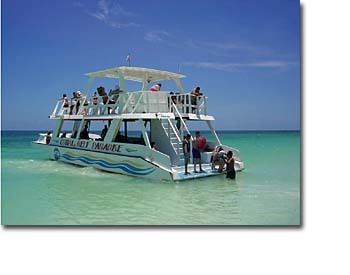 It offers sea-faris, on board catamarans, snorkeling and other recreational options. It also features bar and grill services. The turiguano isle is not part of the archipelago (it is not connected to the mainland by means of a highway that was built in the 60's) but, given its proximity to the Jardines del Rey keys, deserves to be also mentioned, especially considering its many tourist attractions. 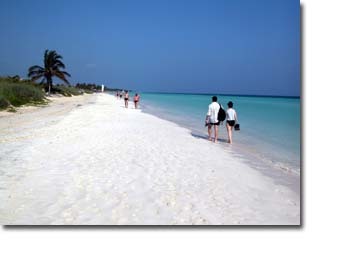 Which extends over 4 square km and is located at the beginning of the causeway to Cayo Coco. 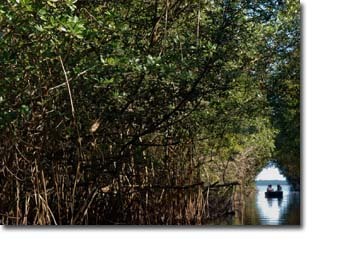 The lake has 4.5 km of natural channel and is the right habitat for numerous species of fresh water fish. It is the a well-known international bass fishing site that offers the fishermen all facilities for a great catch ... they ... well they just need to prove that they have the skills. Which stretches over an area of 66 square km and holds 130 million meters cubic of water, is renowned for an interesting phenomenon taking place in it: waves caused by the wind produce a distinctive whiteness in the water due to the reflection of the bottom, rich in lime stones. This lake is the biggest fresh water reservoir in the country, and in one of its sides has the laguna de la Leche cave, transformed into a facility that features a number of shows. The cave is merely 3 km far from the city Moron. This lake has twice hosted the Jardines del Rey Cup, an off-shore, fast (F-1 type) boat competition that comes to complement the traditional water carnivals, with its pageant of attractive young models and beautifully decorated ships, exhibitions, competitions and water games. But it was not always so at Turiguano. For many years, the Turiguano isle and the Jardines del Rey keys could only be reached from the San Fernando Pier, in Moron city, by sailing along a narrow channel. This was before the construction in recent years of highways, causeways and airports connecting the whole area. In the past, the Turiguano isle was the only place in the region that was well known and had attained some development. In 1934 entrepreneur EL Baker took a decision that proved remarkably important for his business career and which would result in Turiguano isle become world known: Baker visited King Ranch, in the US, which was the original producer of the renowned Saint Gertrude cattle, a genetic crossing between the Shortan and the Brahman or American Cebu in a proportion of 5 and 3 eights respectively. At Ranch King he bought young bulls, directly obtained from Mr. Kleeberg owner of the estate. The animals arrived in Cuba on December 12th, 1935, and after a careful crossbreeding process, the first Cuban Saint Gertrude had become internationally famous and the Turiguano farm admitted as the second world producer of the breed with King Ranch itself buying animals from it. In 1958, Mr Baker sold the Turiguano property, cattle included, for a huge profit. The price was set at the four million dollars. As early as 1947, local Camaguey poet Nicolas Guillen, later to become Cuba's National Poet, had already sang to the wonders of the estate. On February 15th, 1960, the management of the Turiguano estate was entrusted to Manuel E.Fajardo Sotomayor (1932-1995) a Rebel Army commander and one of the first farmers to join the Cuban revolutionairy struggle. Commander Fajardo and the Rebel Army's Working Battalion are behind the many wonders that were made possible in the area, including the impressive Cayo Coco resort. That area's development program contemplated a total transformation, which Fajardo initiated and saw to its end. Under him, large modem pig farms were established, the Tinaja beach was developed, a fishing complex was built, and the electrification of the Turiguano isle was accomplished. Two years after Fajardo's arrival, Turiguano stopped being an isle thanks to the construction of the highway that unites it with Moron, on the mainland, and which extends over more than 20 km across marches and swamps. The highway was instrumental in accelerating the ambitious plan designed for this isle, which included building inner roads and the completion of the village, with its Dutch-style houses, its school for both children and adults, its shop, and its many other facilities. Turiguano is no longer a forgotten island, but a place full of life, poetry and sad stories. Nowadays there is no need for a boat to access this spot and there is nothing that recalls the times of a dreadful journey through Laguna de la Leche to get there. Feria Jardines del Rey. Annually held fair for the promotion of this new Caribbean destination. This fair is usually attended bu tour operators, travel agents, airline representatives, tourist executives and the national media that come here to assess the current and future attractions offered by this destination. The Steam Locomotive Festival. This festival is hosted by the Moron City's Railway Station every December. This popular event retrieves the city's railroad traditions through contests and exhibitions of early 20th century still active locomotives. 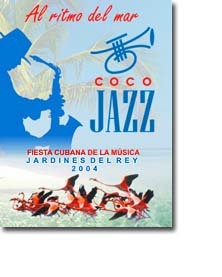 The Jardines del Rey Jazz Festival. This festival is a true gift in every way. It runs in the month of June when famous jazz musicians gather hear to play live making the place a feast full of joy, rhythm, color and flavor and of course, the exquisite Latin Jazz. Held on October each year the event is devoted to promoting Cuban popular music. Famous musicians come to this place to play their son, the most deeply rooted of all Cuban rhythms. For five days tourist might enjoy live concerts, buy CD's or participate in dance contests. 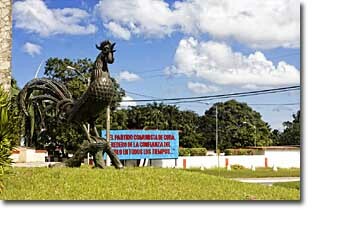 The closest point to the Cayos on the mainland is picturesque Moron, with its rooster monument (a local symbol) and the architecture reflecting European styles from the 19th century. On the way to the Cayos, you'll pass a what looks like a little Dutch town. 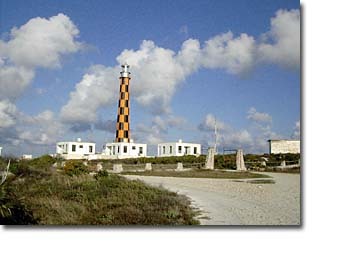 Built as a cattle-raising community in the 60's, it is in Turiguano Island. The capital of the province, the city of Ciego de Avila (founded in 1840), has an architecture with a free interpretation of classicism from the elected period and Andalusian and art-deco influences. Be sure to see Marti Park, the center of the city's social life; the Principal Theater; the San Eugenio de la Palma Church, the Provincial Museum; and the former Colonia Espanola (Spanish Colony), now the community center. Ciego de Avila also has several night spots that offer evening entertainment, with an active artistic and cultural movement. Other attractions in the province include Cunagua Hill, a wildlife refuge 2742 hectares in size that is ideal for horseback riding and hiking; Florencia, a small farm community in the foothills of the Jatibonico. Where you can go horseback riding, learn about the lives of farmers, explore the valley, and see tabacco nad other traditional crops; a man-made lake; and the swallow of the Jabonico River, up in the mountains. Leche (Milky) Lake, a little under two miles (three km) in size, is the largest natural lake in Cuba and a natural refuge for Roseate Flamingos (Phoenicopterus ruber ruber) and other water birds. Regattas are held here, as in an annual water carnival. At Oasis Farm, near the capital of the province, you can learn about Cuban farm life. The seven lakes surrounded by thick vegetation at the Aguachales de Falla Hunting Preserve attract large numbers of endemic and migratory ducks. The Moron Hunting Preserve has large flocks of Mourning Doves (Zenaidura macroura) and White-winged Doves (Zenaida asiatica). This tropical paradise has more than 2600 rooms and infrastructure that easily meets a wide range of tastes and needs. The 4- and 5-star hotels blend with their surroundings. All are near the beach and have All-Inclusive plans. Their facilities include air-conditioned rooms, each with satellite TV and mini-bar, in both the hotels and bungalows. Rooms for visitors with disabilities. Grills, speciality and buffet restaurants, swimming pools, bars, evening entertainment, baby club, taxis, rental cars, doctor on call 24 hours a day, gymnasium and sauna, beauty parlor, massages, shops, water sports equipment rentals, discotheques, sports and recreation areas, and multipurpose rooms. Nearby, you will find service centers, banks, traveler's aid offices, an international clinic, an international counseling bureau, travel agencies, an airport, restaurants, cafeterias, bars, cabarets- such as the Cueva del Jabali (Wild Boar's Cave), in a natural setting, four international scuba diving centers (two on Cayo Guillermo and two on Cayo Coco) and the Cayo Coco-Guillermo Marina (6 moorings, drinking water, 110- and 220- volt current, a commissary and protection 24 hours a day). The marina will fit you out with everything you need for some really good sports fishing. 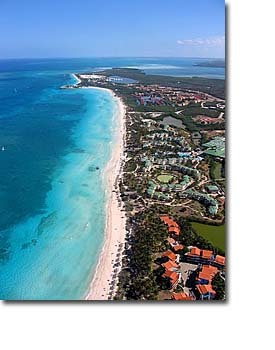 At the beginning of the 1940's, interesting developments were taking place in the area of Jardines del Rey. The newspaper Noticias de Hoy had reported about separatist activities in the province of Camaguey, and especially near the Turiguano isle, where military exercises were taking place, and Nazi propaganda was being distributed; the orange groves property of Italian Principe de Ruspoly, in the municipality of Ciego de Avila, were being used as training site and weapon warehouses. 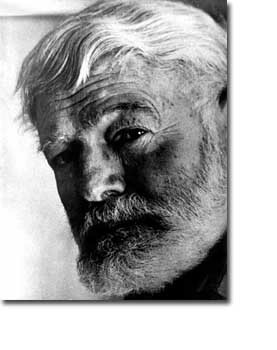 It is then that a truly unforgettable character enters the keys'history: Ernest Hemingway. As early as 1942, Hemingway had established the "Cook Factory" a peculiar antifascist operation agency, with its general staff at Finca Vigia, had stored weapons in his yacht Pilar, and started his hunt for German submarines. The project had been classified as top secret by the US Navy Command, but the writer had simply code-named it "Friendless" after one of his cats. For nearly two years Hemingway sailed the waters off the north coast of Cuba in search of nazi submarines. His plan was to capture one of them, to take its crew as prisoners, get hold in secret communication codes, so that a large scale operation could then be unleashed against the German fleet deployed in the North Atlantic. Hemingway conducted his mission at a time when the defense of the Gulf was weak; his resources were not much, but still he was capable of effectively organizing his own small military group. The weapons he had been provided with were a few rifles, pistoles, hand grenades, explosives, ammunition, a short wave radio transceiver, binoculars for night vision, life vests, and a nautical chart. They read:"For US Military Use Only". According to Gregorio Fuentes, the Pilar skipper, they underwent training at Cayo Paraiso, then set sail toward waters off Camaguey, and did not leave the area for approximately 3 to 4 months. Participants in the adventure recall how they basked in the sun, hunted iguanas, and chased wild horses at Cayo Romano while Hemingway swallowed large portions of raw crabmeat seasoned with lemon, one of his favorite dishes. Hemingway recorded his living at the keys in his posthumous book "Islands in The Stream". Of Cayo Guillermo he wrote that it provided "the most abundant fishing" he had ever seen, and the nearby lied Cayo Guillermo, "green and promising" He said that they had encountered a place where flamingos came to eat, and that there were many many coconut trees ... at Cayo Coco, of course.